Update DEC. 2017: Mavea discontinued their pitchers in the USA. Mavea replacement filters are still available on Amazon. Germans are known for their excellent technology and love for detail. The new Mavea Elemaris filter pitcher, designed and developed in Germany, is bolstering this assumption. If you thought all pitcher filters are more or less the same, read on and discover some of the details that make this one different. This Mavea XL model is available in six different colors. The BPA-free jar can hold 9-Cups and is one of the bigger pitcher filters. Thanks to the functional design, handling is easy. To fill it, you do not need to take off the lid. The pour through lid is just one of the convenient details. And when it is full of water carrying is still easy thanks to the soft grip handle. Four rubberized feet do not only look stylish but also prevent sliding. They are also soft enough to protect table tops from scratches. A nice detail is the integrated microcomputer that tells you exactly when the filter needs to be replaced. While other pitcher filters often rely on guess work, stickers or only measure the amount of water that passed through, is this smart device able to consider water quality, time span the filter is in use and amount of processed water into account. 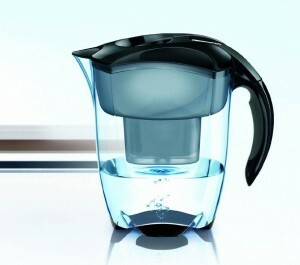 Like most other pitcher filters, the Mavea Elemaris takes care of the most common tap water contaminants. The reduction of chlorine taste and odor and other unwanted elements, such as heavy metals, agricultural chemicals and industrial pollutants is certified by Water Quality Association to NSF/ANSI 42 and 53. Internal test also show a significant limescale reduction by this filter system. The filter cartridge contains activated carbon with silver to prevent growth of bacteria in the filter medium. A special micro-screen prevents carbon particles from moving into the filtered water. - Design details that make handling such a big pitcher easy. - Complete pitcher fills in about 15 minutes. - Not all parts are dishwasher safe. - Part that covers the spout comes off easily. If you are shopping for a filter pitcher, you should definitely consider the Mavea Elemaris XL 9-Cup Water Filtration Pitcher.